Cerberus is a Hellhound boss found in her lair beneath Taverly Dungeon. 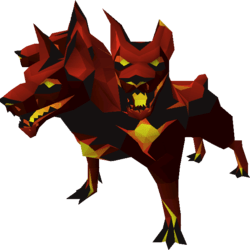 Cerberus can only be fought while on a slayer task for Hellhounds or a boss task for Cerberus and has a slayer level requirement of 91. Cerberus is an extremely popular boss, especially for Ironmen as Cerberus drops the Primordial, Eternal and Pegasian Crystals – three very powerful items which unlock the best in slot boots for all three combat styles. The most common tactic to use at Cerberus is to use best in slot melee gear. Cerberus is a very dangerous boss fight which will require some practice before mastering. Cerberus has a few different special attacks all of which can be deadly if not dealt with correctly. For the majority of the fight, you should use the protect from magic prayer and attack with melee. Triple Attack – Cerberus will always start out the fight the same way. she will fire three orbs at the player, the first of which dealing magic damage, followed by ranged damage, followed by melee damage. If you switch your protection prayers with the correct timings, you can nullify all the damage from this attack. Summoned Souls – Once Cerberus is below 400 health, she will occasionally howl ‘Aaarrrooooooo’ – summoning three summoned souls too appear from behind the archaic skull. Each of these souls attacks with a different attack style. Blue is magic, red is melee, and green is ranged. The order in which they appear and attack is random each time, however, if you pay special attention you can determine which order they will attack. The western-most soul will always attack first, followed by the soul in the middle, followed by the eastern-most soul. Therefore by looking at their colours, you can figure out which order you will need to switch your protection prayers. If you miss a prayer, you will take 30 damage. If you use the correct prayer, you will consume 30 prayer points (reduced to 15 prayer points while wielding a Spectral Spirit Shield). As this attack is either going to do a lot of damage or drain a lot of prayer points – it’s important to keep both your health and prayer points high during the entirety of this fight. AoE Attack – Once Cerberus is below 200 health she will throw out three puddles of lava – one of these puddles will always land on the square the player is standing on so it’s important to move. If you stand on one of the puddles, you will take 10 – 15 damage per game tick. If you stand within one square of these puddles, you will take half that damage – so it is important to avoid the puddles at all costs. If you can master all of the above special attacks, Cerberus can be an extremely rewarding and fun boss to fight. You can swap out the Dragon Claws for any other decent special attack weapon. The Ghrazi Rapier can also be swapped out for any other one-handed crush weapon and is only used in combination with the Spectral Spirit Shield during the Summoned Souls special attack.